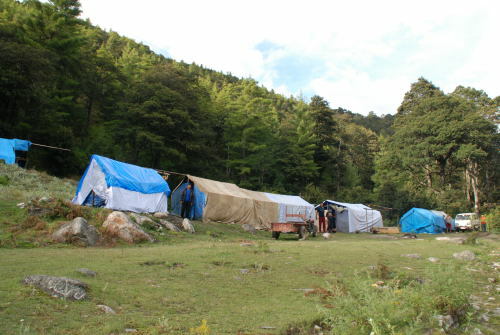 Check out our Mushroaming Bhutan trip 18. to 31. August 2019! 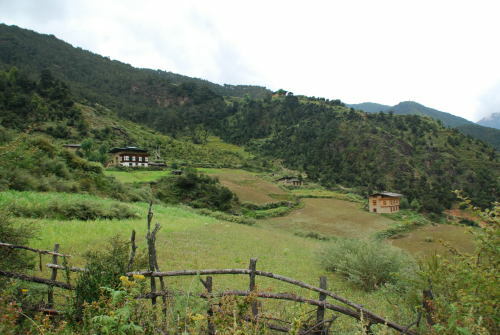 The countryside in Zamto Village, Gaynekha, surrounded by oak-pine forests rich in matsutake and other fungal resources in an altitude of around 3000m. 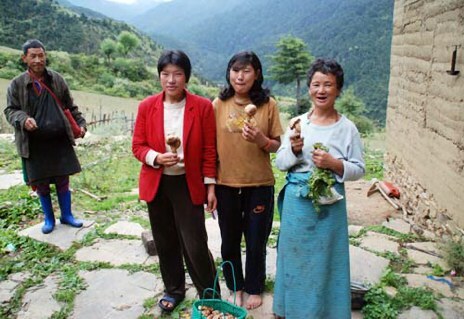 Three times a week matsutake buyers come to Gaynekha to buy fresh matsutake. In September 2009 there were three different companies buying the mushrooms. In the past there were often a few more buyers I was told. Sangay shamu collectors [including in the center Kencho Zangmo and Dema] with their day's harvest in Zamto village. 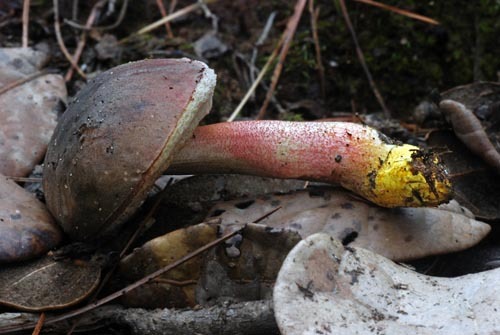 The camp of matsutake collectors on a small meadow surrounded by dense pine-oak forests. Thirty-five men from a lower village, for whom the walk up into the woods is too far for a daily hunt, are camping out here for up to two months. They pick altogether about 10 different edible species, many of these for personal consumption and as gifts. The beautiful Amethyst Deceiver or Tallowgill (Laccaria amethystina) between oak leaves. The Buddha Mushroom - Tricholoma matsutake. 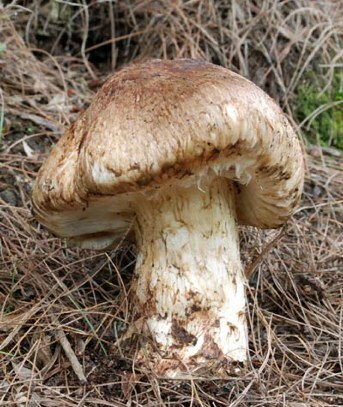 Bhutan's matsutake is the same species as the Japanese matsutake. 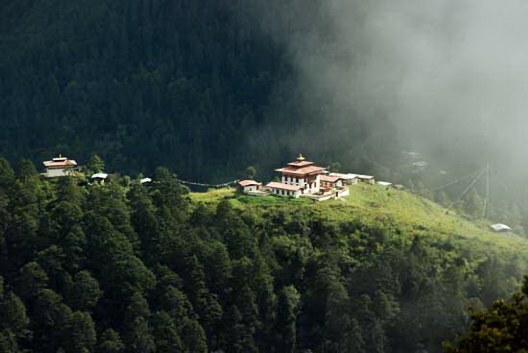 In Bhutan it is associate with pines and oaks. A newly built farm house in Gaynekha. Matsutake improved the living standard here substantially. Fungal income is being used to invest in agriculture and thus to diverse the economic base of rural households. 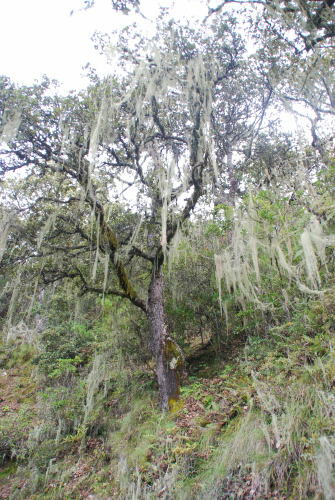 An oak (probably Quercus semecarpifolia) with Usnea longissima lichens, which has recently been reclassified as Dolichousnea longissima (Ach.) (Articus 2004), dangling from the branches. It Bhutan it is often known as Dakini hair; Dakinis are female beings which usually reside in a different sphere but once in a while manifest in the human dimension to help humans along the path of wisdom. Back to earth, D. longissima is very sensitive to sulphuric air pollution and microclimatic changes brought on by logging. Thus, it has unfortunately disappeared from many sites in Europe and North America. Kids on the way home from school marveling at a big Sangay shamu. 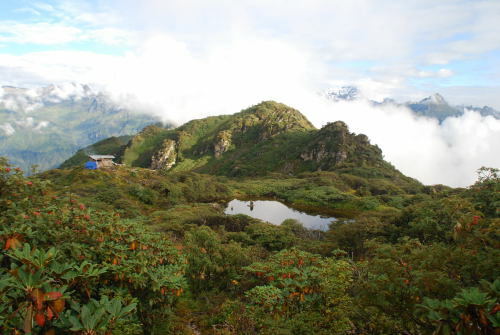 Check out our Mushroaming Bhutan trip 18. to 31. August 2018! Goli Shamu - Catathelasma imperialis - The Big Cat - "A cousin of Sangay shamu" as Kencho Zangmo pointed out. Local knowledge reflects taxonomy very well. 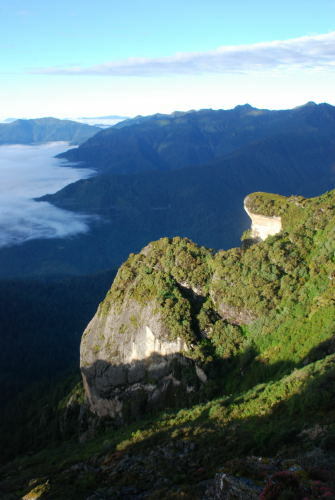 Sese Shamu as Cantharellus cf cibarius is known in Dzongkha. 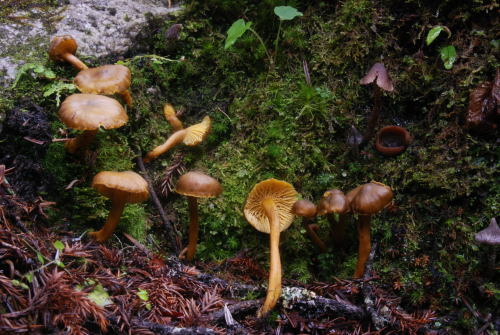 The Chanterelle is highly esteemed and very popular in Bhutan. 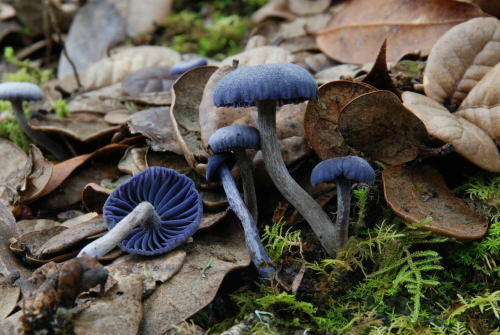 In mid September the Himalayan Gypsy (Cortinarius / Rozites emodensis) was abundant in the woods. 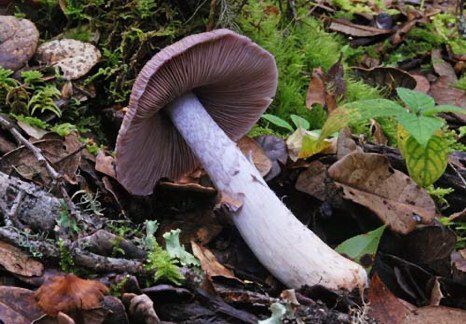 It is just as the closely related Gypsy mushroom (Cortinarius caperatus / Rozites caperata) of the Northern hemisphere a choice edible. A tiny & slimy, but beautiful bolete (Aureoboletus thibetanus) in Tango. 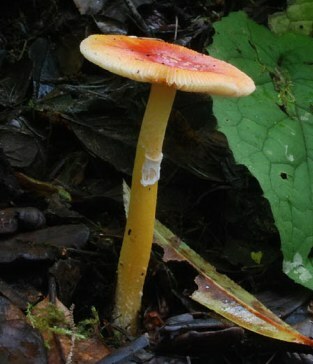 Amanita rubrovolvata, with its typical red colored edge of its volva, remnants of the universal veil typical for Amanitas. 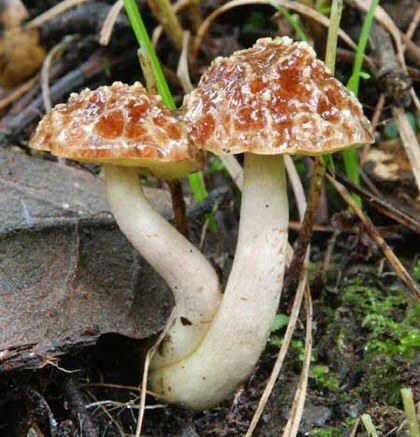 This mushroom is also found in Japan. 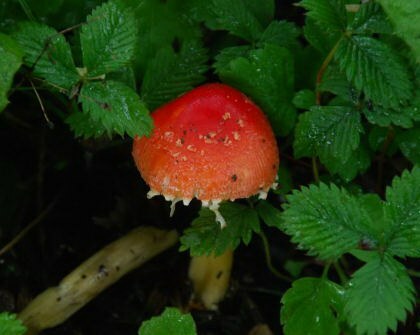 Amanita rubrovolvata cap surrounded by strawberry (Fragaria sp.) leaves. 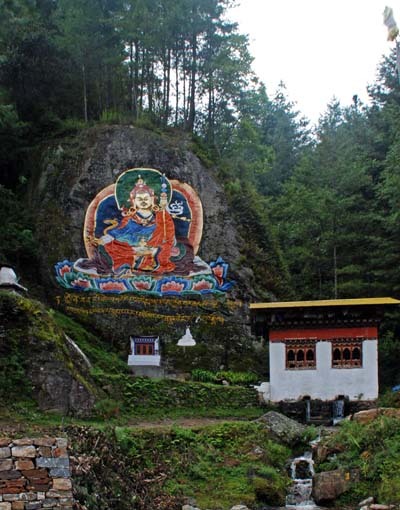 A sacred spring below Tango and Chari Goenba with a big carved and painted Padmasambhava image. A dark blue-gray chanterelle (Craterellus cornucopioides) known as the Horn of Plenty. 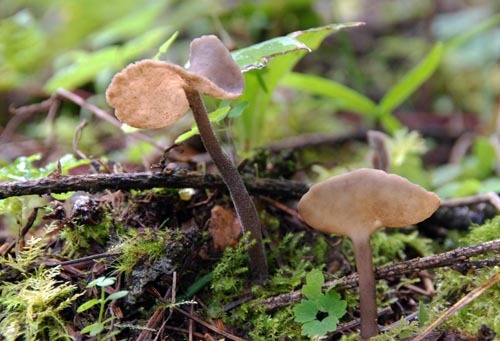 It is an excellent edible, but is not often eaten in Bhutan because of its dark color. We cooked it up and it was wonderful. Near Tango I found something looking very closely to a winter chanterelle (Craterellus cf. tubaeformis), it was just a bit darker as the ones I have collected in North America and Europe. However, I was told by Wangdi, a fungophile monk that this mushroom was not edible. 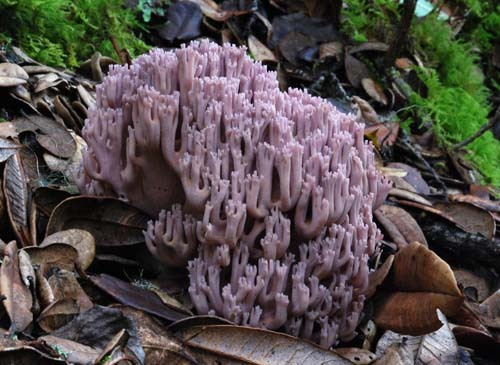 "Not edible" can sometimes mean, "we do not know, so we do not eat this mushroom". This winter chanterelle I would have eaten without much hesitation, but would have started out with small quantities. Helvella chinensis, also known as Helvella villosa looks like a regular small basidiomycete mushroom, but the absence of gills and the smooth hymenium reveals its ascomycete nature. Above treeline in Domende above Tango Gompa in 4000m (12,500ft). The retreathut was built by a monk, who had just finished his three-year retreat there. What a location! 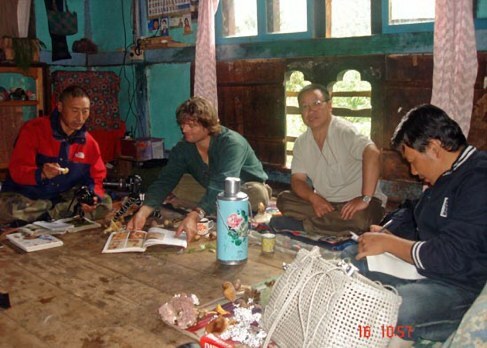 Dawa Penjor, Director of the National Mushroom Center, Daniel Winkler and Dr. Phuntsho Namgyel and a member of NMC identifying mushrooms in Aum Kuchum's house in Zamto village. 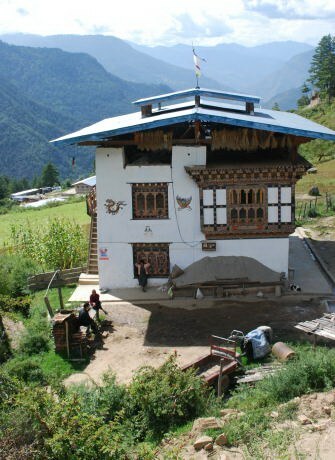 The farmhouse belongs to the family of Aum Kuchum, the lady who had found the "first " matsutake in Bhutan. 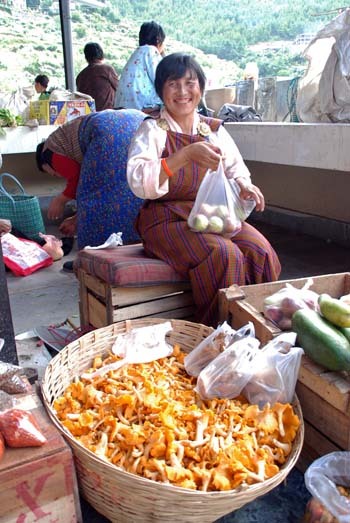 As she was selling her mushrooms on the vegetable market in Thimphu they were recognized by a Japanese businessman as identical to the Japanese matsutake. 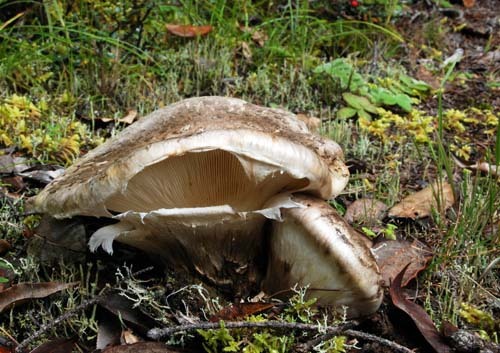 This event was the starting point of the Bhutanese Matsutake industry. 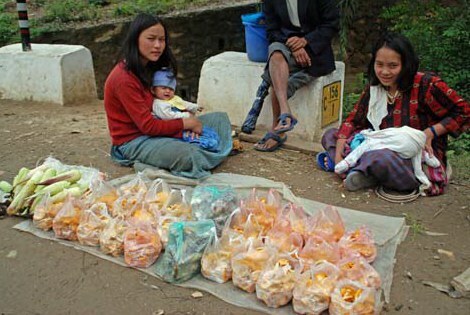 Two ladies selling chanterelles, corals and corn along the Thimphu-Paro highway. 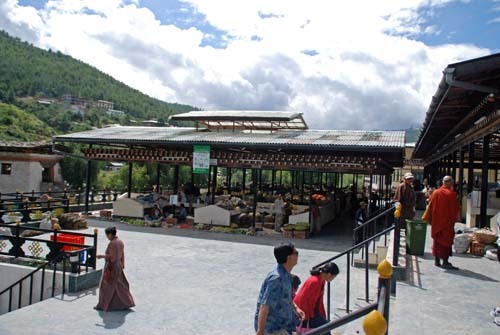 A beautiful open air market was recently opened in Thimphu. The market is organized by the regions where the sellers, mostly farmers selling their produce, are originating. Farmers from the lowlands offer mangoes, bananas, sugar cane etc., midland farmers egg plants, potatoes, apples etc. 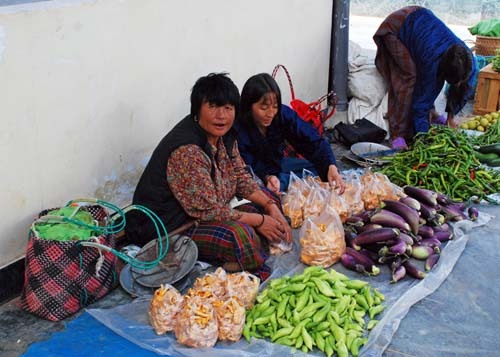 All of them offered lot's of chili peppers, seemingly Bhutan's most beloved vegetable. The investment in such a market facility is part of the Bhutanese government's efforts to improve livelihoods of rural communities. Don't you want to buy any of my gorgeous chanterelles, big egg plants or hot chilies? 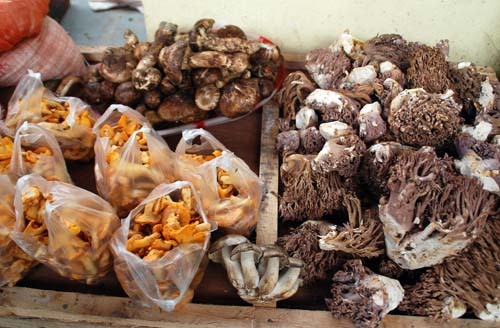 Chanterelles, corals and matsutake where the most common commercial mushrooms on the market in mid September. Also visible in this picture in the lower center are "Ripongkar", probably Lyophyllum aggregatum = Lyophyllum decastes. 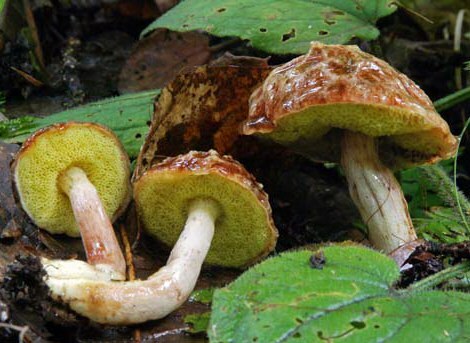 In Bumthang (Ura und Shingkhar) this mushroom is also locally known as Nyala or Ngala Shamu. 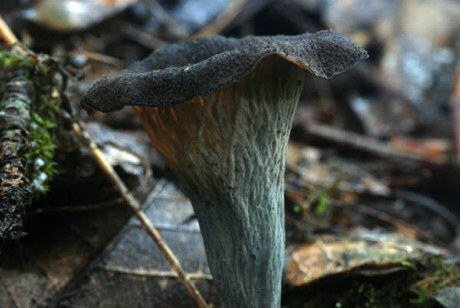 Another sought after mushroom in Bhutan is this mushroom, known simply as "Shamu" = mushroom. 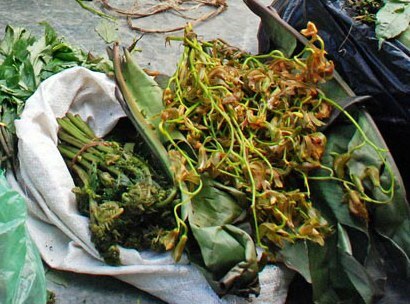 So far, it is mostly collected in the West of Bhutan, especially in Haa (and also in Bumthang and Wangdue District acc. to Karma Singay), where it grows on wild rose shrubs (Rosa sericea). Dawa Penjor informed me that the cost in the local market is Nu.15,000-20,000 per kg dry. Price is driven by the export market in China, where it is regarded as a medicinal. 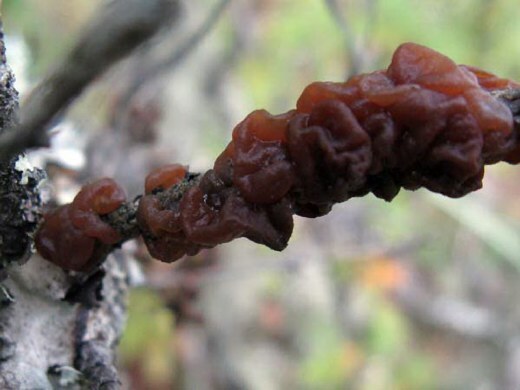 It has been suspected to be something close to Tremella foliacea (Tremellaceae) or maybe Exidia glandulosa (Auriculariaceae), two species not related at all, apparently they are hard to identify. Elinoar Shavit came across some "black fungus" in San Francisco's China-town and reported, "these cost 5 times more than the regular wood-ear, had a smoky smell (from the way it was locally dried), and had an extremely powerful taste and aroma – aside from the smoky flavor from the drying. The merchant could not give me any info about the fungus, and wouldn't give me any info about its origin other than "it came from the high mountains". He did say, however, that its medicinal capabilities were tremendous and that people add small amounts of it to food to help clear up infections." 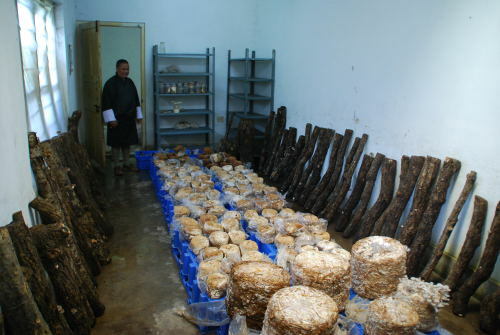 A mushroom growing room at Bhutan's National Mushroom Center in Simtokha near Thimphu. Shiitake (Lentinula edodes) is growing on oak logs, Oyster Mushrooms (Pleurotus ostreatus) in the middle, and the medicinal Reishi (Ganoderma lucidum) under the shelf. 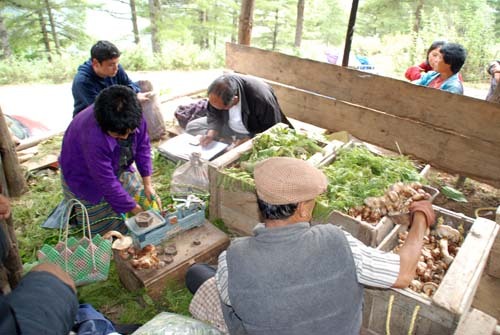 Here a link to a short story on mushroom cultivation in Bhutan. 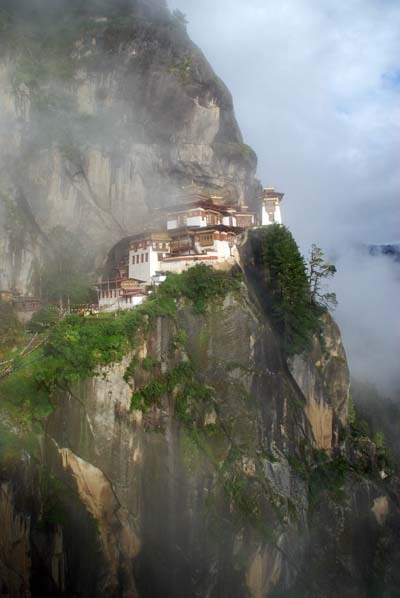 The clouds lifted and allowed a peek at the most stunningly located Taktsang Goenba, the Tiger's Nest. 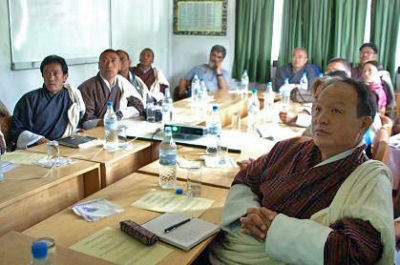 Text from the Ministry webpages: The seminar, chaired by the Hon'ble Agriculture Secretary, Dasho Sherub Gyaltshen (top middle), was attended by various MoA officials (DW: front right Mr. Tshitila who introduced me to the MoA) along with a representative from the World Wildlife Fund. 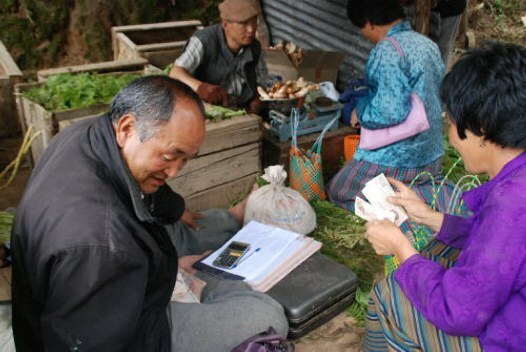 The "Fungi as a sustainable source of income - The Case of Yartsa Goenbub and Sangay Shamu in Tibet," was the subject of the presentation organized by the Council of RNR Research for Bhutan (CoRRB). The presenter, Mr. Daniel Winkler (seen below extreme left), is a freelance researcher and an expert in fungi, particularly in Cordyceps and mushrooms." Daniel Winkler presenting at the Ministry of Agriculture in Thimphu. The same night a report on the event was on the ministry's webpages. I had no idea, but received an email by someone from the US who asked me "How long ago were you in Bhutan and did ever anything come about". I had no idea what this friend was writing about, but he send a link and so I saw the brand new webpage. Both event photographs were taken by Tandin Norbu & text in Italics written by Tshering Doma. 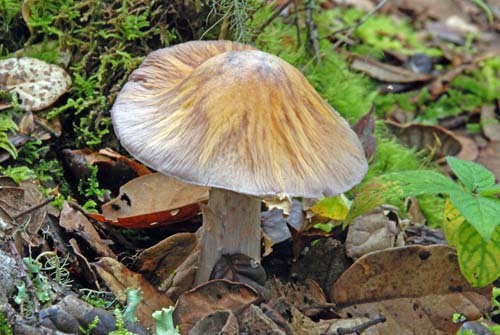 The Himalayan Gypsy (Cortinarius emodensis) resting on its site. 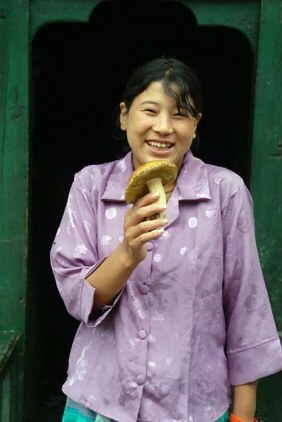 Link to an article on the Himalayan gypsy mushroom with more gypsy photos also from teh Tibetan areas of Northwest Yunnan. This bolete was very common in all the oak forests I visited. 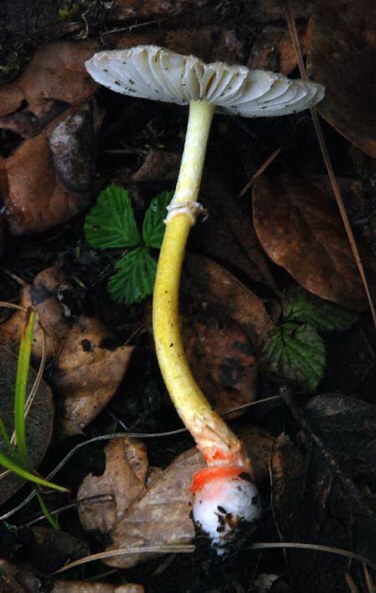 It seems to be close to Harrya chromapes (=Tylopilus / Leccinum chromapes), since it has red flakes on the stipe and a bright yellow stipe base. 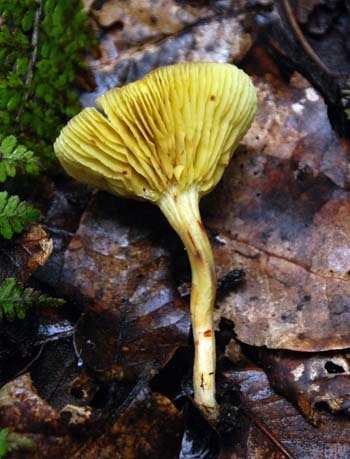 Amanita rubrovolvata is a small Amanita. None of the specimen I found had a cap wider than 10cm. 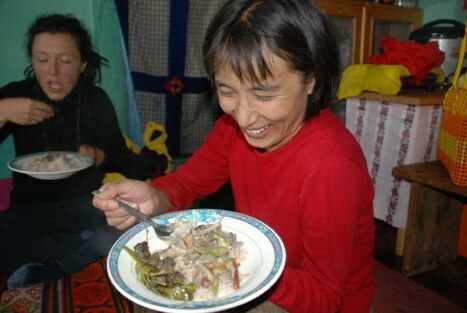 Dorji and Katrin eating a typical Bhutanese lunch consisting of red rice, ema datsi and shamu datsi. Datsi is a cheese sauce, somewhat close to our idea of a cream sauce, and a Bhutanese favorite. Ema are green chilies. In Bhutan hot peppers are a vegetable, not a spice. Incredible amounts of hot green and red chilies are consumed daily. Not surprisingly, the shamu datsi - mushrooms in cheese sauce - were also fortified with lots of green chilies. The mushroom cooked was the Himalayan gypsy (Cortinarius emodensis or Rozites emodensis), but all the chili - for my taste - overpowered the nice fungal flavor of the Gypsy. 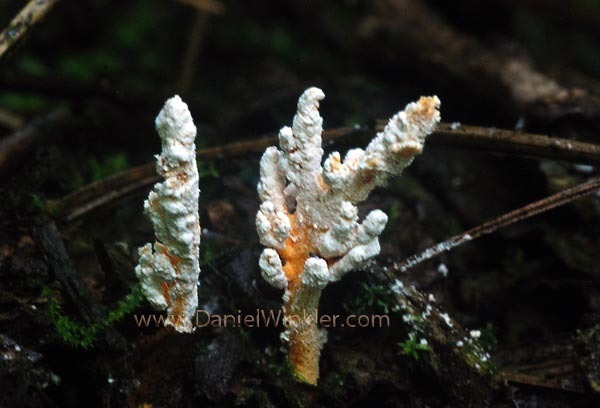 Thin-stemmed Isaria (Isaria tenuipes), an anamorph of Cordyceps was growing on a larva in the woods below Chari Goenba. 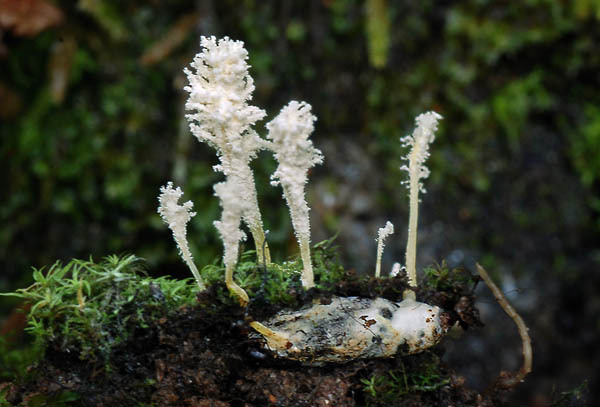 The white powder are conidia, cells that function like spores inCordyceps anamorph. Another Isaria species growing in the same location. Here the mummified insect has been exposed, which this fungus killed and feeds from. Phylloporus sp., a gilled bolete that was common in the oak forest. 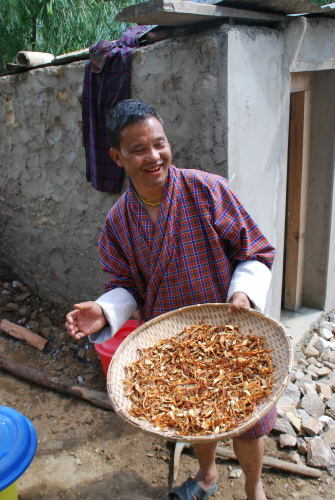 Gup Karma Gyaltshen is showing his Chanterelles, he just had sliced up and spread out for drying in the sun. 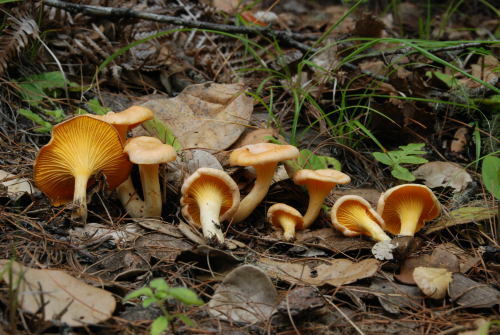 A lady is selling 'Sese Shamu' (Cantharellus cf cibarius). An edible orchid Cymbidium erythraeum Lindl, locally known as 'Aula Tshe' is regarded as a delicacy in Bhutan as almost all the Cymbidium species as well as some Calanthe (com. Rebecca Pradhan). Also for sale are some fern fiddle heads and a leaf, most likely an Elatostema sp., locally called 'Damroo'. The edible orchid Cymbidium erythraeum and fern fiddleheads. 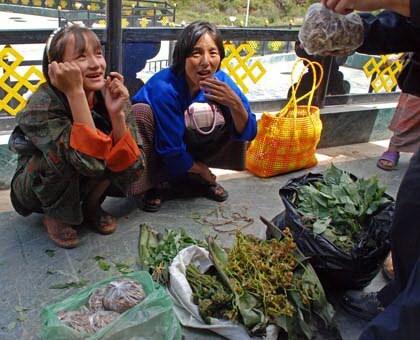 There are several fiddleheads eaten as seasonal vegetable in Bhutan. Most of them belong to the genus Diplazium; the most popular one being Diplazium esculentum, locally known as "nakey" (information provided byTandin Wangdi, of the National Herbarium, Thimphu). 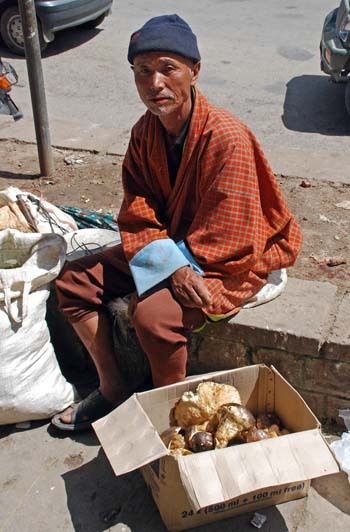 A Bhutanese farmer selling "Goli Shamu" or as he called it "Bone Shamu", the Big Cat (Catathelasma imperialis) on the street in Thimphu. A gompa / goenba near Tango. 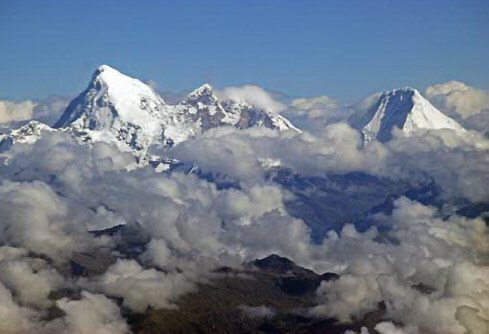 Jumolhari or Chomolhari, the Mountain of the goddess, with 7314 m or 23396 ft, Bhutan's highest peak. 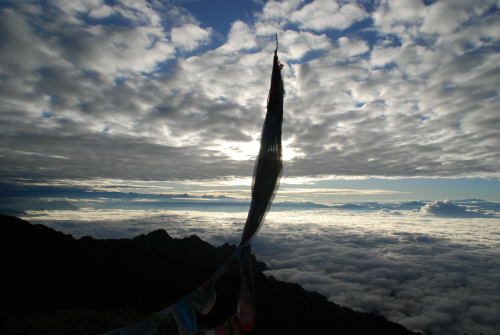 It is located in the North of Paro and to the South of Tibet's Yadong. Roland's great webpages with tons of links to many aspects of Bhutan. by Milagro Mata, Dawa Penjor & Sabitra PradhanNational Mushroom Centre, 316 p.